It's a life-size doll house! Here’s a playhouse truly fit for royalty! This charming life-size doll house has belonged to Queen Elizabeth II since she was 6 years old, and it’s so beloved to Her Majesty that the 92-year-old still visits it occasionally. Rare photos of “The Little House,” as it's lovingly called, have been released, showing the young princess playing in it with her sister, Princess Margaret. The images from the 1930s show the sisters peeking out the windows and sitting on the doorstep of the kid-sized mansion. 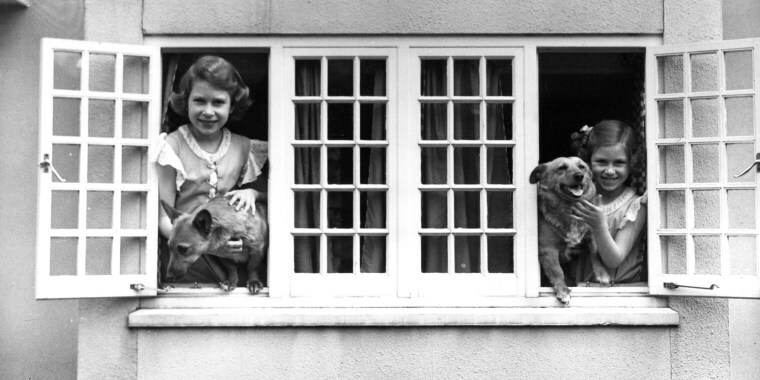 In a 2012 BBC documentary called “Our Diamond Queen," the Elizabeth’s granddaughter Princess Beatrice took cameras inside the cute cottage, which had recently been renovated with a re-thatched roof, new curtains and an overall spruce-up. Given to the young princess by the people of Wales in the ‘30s, the two-story home’s exterior features plenty of windows and a door with the Welsh name “Y Bwthyn Bach” (“The Little House”) inscribed above it. Inside, the tiny living room features little pieces of china and glass made especially for the house, and there’s also a portrait of the queen's mother hanging above the mantel. The home even has lights, a gas stove and functional plumbing. In the bathroom, you’ll find a chic clawfoot bathtub, sink and toilet. The playhouse sits on the grounds of the Royal Lodge of Windsor, where Prince Andrew currently resides. Today, you can find the young royal grandchildren playing in the same playhouse their grandmother did — and, who knows, she might even show up for a cup of tea! “Still now, she likes to come back and visit,” said Princess Beatrice.